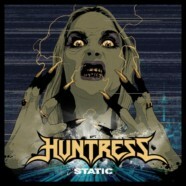 Singer Jill Janus of Huntress has always been very open and candid about her battle with mental illness in her lyrics and the band’s third studio album- Static viaNapalm Records is no exception. From the chugging groove of “I Want to Wanna Wake Up,” which deals with Janus’ own struggles with Dissociative Identity Disorder and a secondary personality that was doing things without her knowledge to “Mania,” a nearly 9 minute beast that will resonate with anyone struggling with mental illness, Janus repeatedly bears her soul for all to see. Bellicose riffing and rampant double kick drive opener “Sorrow.” A song inspired by 1970’s lesbian vampire movies, while lead single “Flesh” is a no nonsense bare bones rocker about a female serial killer that craves the flesh of other women. Elsewhere, “Brian,” a song about an eccentric old man that Janus calls her Forceful Savior sees her really tapping into the upper register of her staggering four-octave vocal range and title track “Static” will burrow deep into your brain, much like the low frequency hum of electronics that get inside your head, slowly turning you into a zombie. “Four Blood Moons,” a song the band played during the actual Blood Moon on the Motorhead Motorboat Cruise is built around massive hooks and even more grandiose solos and speaking of impressive solos, the darkened fretwork and stunning vocal acrobatics of “Harsh Times On Planet Stoked” will stick with you long after the album finishes. Saving the very best for last, “Noble Savage,” a song about Janus’ Indian heritage and closer “Fire In My Heart,” which digs into her love of all things Danzig are some of their best work to date and wind up being a couple of the album’s true highlights. Here’s the bottom line. Static builds on the strength of their past efforts while pushing boldly into the future.